The FRIDAY THE 13TH remake hits theatres next week, and I'm very excited. Only because it's Jason doing what he does best. I hate remakes, and I can't stand Michael (I fucked up Transformers) Bay. I think he's just as big of a douche bag as Paul (I ruined Resident Evil) WS Anderson. Almost every remake produced by Bay has been complete trash. This new FRIDAY looks interesting however, because not only is it a remake, but it's a combination of the first 3 original movies. 1. It's back in Camp Crystal Lake 2. Both Jason and his mom are in it 3. Jason starts off with the sack and later wears the hockey mask. That alone is what sold me on this movie, and I'm very excited. The only thing I'm not big on is the fact that it looks and feels alot like the TEXAS CHAINSAW remake, with its dark and gritty look. To be more positive, Jared Padalecki from SUPERNATURAL is the star. To celebrate the release of the film, some of us are having our very own FRIDAY THE 13TH marathon where we watch every single film. Not all at once though. You can't top 10 movies in one day, that's just impossible. This marathon will run all week up until the release of the new movie. Some of our readers have asked us what we thought of the movies. Well you know us, we're fanatics and we can't call ourselves horror buffs if we don't have the original FRIDAY THE 13TH in our collection. We do; in fact we have all the movies. 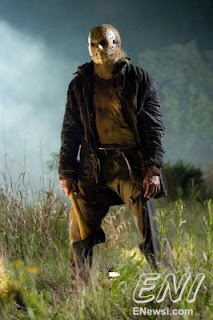 So for today, I'm going to post up what I think of ALL the F13 movies. This isn't the usual review, this is going to be just a summary of what I think of each movie. First, I'll start off with the original 1980 classic.